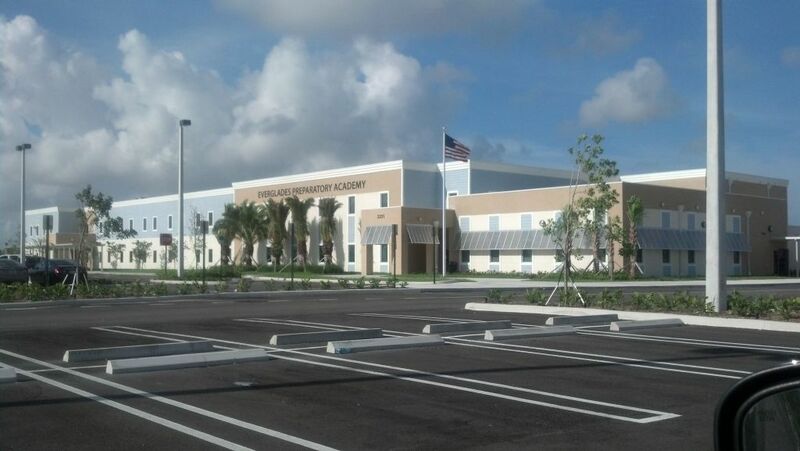 Everglades Preparatory Academy | Thompson & Associates Inc. This project is a Charter School to be constructed in two phases. Phase 1 consisted of a two-story building encompassing approximately 52,500 square feet for students in grades six to eleven. The school opened in August 2012 for grades six to ten and will add grade eleven for the school year 2013-2014. Phase 1 will accommodate up to 884 students in grades six to eleven. Thompson & Associates prepared the final design packages including paving; grading; drainage collection systems; water distribution system; wastewater collection system and lift station; signage; pavement marking; and erosion and sediment control plans. T&A also provided permitting assistance to the client submitting plans to all local, state and federal agencies for review and approval; finalization of construction documents; engineering support and oversight during construction including shop drawing review and inspection.